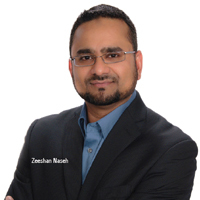 Zeeshan Naseh, President and CEO, Connectloud, loves to tie sociology and physiology together—be it his personal or professional life. Taking this philosophy forward, Naseh aims to transform Connectloud—a Plano, TX, based cloud solution provider—into a high velocity innovation engine. Naseh feels that on the surface, the cloud would seem to have answered many needs for today’s enterprises. It reduces capital expenditures and frees businesses from on-premise data centers that are often duplicated, siloed and underutilized. Yet, something is missing. Implementing cloud can take months, meaning capital expenditures are simply being replaced by expensive engineering hours. The total cost of ownership is still too high. Connectloud essentially reduces this overall cost that the clients have to invest— literally to one fourth of the current expenditure. The company also provides the agility of a true cloud to the client’s fingertips. “The tasks that typically takes months to implement from application development,now takes minutes,” affirms Naseh. “We give customers the flexibility to go to container based workloads as well as provide cutting edge features and functionalities,” he adds. The company uses VMware’s ready-to-use platform to provide a wide variety of functionalities to its clients. “Our partnership with VMware has been very beneficial to us,” asserts Naseh. “It has increased our credibility and helped orchestrate real workload settings on the VMware virtual machines across multiple data centers,” he explained. Connectloud provides unification of clouds and single management plane for both private and public clouds in an extremely secure fashion. With virtual networking built into the platform, Connectloud’s uCloud™ can be deployed in the customers’ environments literally in a matter of days. “This provides the elastic capabilities where our patented virtual networking could be stretched from within the client’s existing data center to the public cloud forming functional and metered hybrid clouds,” reveals Naseh. For an elaborate understanding consider the case involving a financial firm that was operating two data centers. The client had issues with application development and the consumption of infrastructure from the financial application t h a t they were creating.In addition,the whole lifecycle was extremely lengthy—they had to move to a separate pod to perform QA and move back to production. The other problem was the high cost of maintaining outside disaster recovery. Connectloud saw the core problem of building out the private cloud, and rolled out an application environment that supported the whole application development lifecycle. Connectloud’s virtual networking allowed the client to connect the two data centers in an extremely cost effective manner and provided them the flexibility needed for disaster recovery across the platform. “Built upon SaaS based technology, uCloud™ offers a single, unified and secure point of control over all clouds to give CIOs the real-time visibility that they need to gain control and bring down operating costs,” claims Naseh. The solution never touches the client’s data, so it is natively compliant with HIPAA, Sarbanes- Oxley and other regulations. “The open source platform is extremely scalable and provides full services and capabilities to the customer—including virtual networking, and management monitoring orchestration and provisioning,” he adds. “At Connectloud, our mission is to deliver a unified cloud solution that is simple, flexible and delivers true business value,” says Naseh. “As the future takes shape, the needs of business extend far beyond singular, automated data clouds and we aim to tap into these prospects,” he explains. The company also aims to expand its channels to reach broader market segment within the U.S. and beyond. “Our roadmap is filled with many cutting edge solution sets that are going to become more and more vision centric in the future,” concludes Naseh. A cloud software company that empower enterprises with quick scalable, secure, and multi-tenant automation across clouds of any type and for clients from any segment.